Italia. Marvel of Mediterranean marvels. Bootcrafty spellcaster of bewitchment. One visit is never enough, not for the Phoenicians, Greeks, Arabs, Normans, Swabians, Angevins, nor the Aragonese, all of whom set foot on Italy’s islands and mainland and quickly proceeded with colonial ambitions. In the five or so centuries prior to Rome’s ascendancy, Greece left such an indelible mark on Italian soil and psyche that Italian nationalists choose not to delineate the Greek period from the Roman period from the Medieval and Renaissance periods—it’s all Italian history, part of what makes Italy, Italy. Twenty-five-hundred years removed, a modern traveler can’t help but look at the glorious remains of innumerable Greek temples, theaters, walls, vases, etc., in Paestum, Metaponto, Siracusa, and other cities in Magna Graecia—the ancient Greek settlements in southern Italy beginning in the eighth century BCE—without momentarily wondering if the Greek period was the golden period in the Boot’s history. Remember, this was the Greece of Pythagoras and Archimedes and Aristotle, and in Italy’s south (perhaps, Sicily most of all) the Greeks may have realized the ideal balance between man and nature—a place with abundant sunshine and fresh water, where the orange grows next to the olive, walnut, and grapevine in wide volcanic-ash-rich valleys running to the sea. Yet, Magna Graecia was subsumed by Roman hegemony, and, in historical terms, the Greek presence was muddled by a reliance on the succession-of-empires argument—that succeeding civilizations absorb the strengths and intelligence of the societies they conquer. And while the Greek temples and vases discovered in southern Italy played an important role in shaping our views of classicism, the artifacts weren’t found in Greece proper and the region remained in backwater status in the minds of historians. In fact, until the middle of the eighteenth century, discussion of Magna Graecia was missing from nearly all compendiums of world history. Ironically, only when the American Revolution initiated debate about metropolitan powers and the rights and duties of the colonies they spawned did the full scale of Greek expansionist history garner serious attention. The neglect, it seems, assured that the region remained mostly unexplored until the late nineteenth century, offering “a vast, untapped potential for archaeological research, just when the era of big digs was beginning, with various Western powers competing for the most attractive excavation sites,” writes Ceserani. This era was also infamous for the amount of treasure that was removed from these sites and deposited in museums and private collections around the world. Ceserani tells the pitch-perfect Italian story of an American expedition to Croton, on the Boot’s heel, in 1887. After obtaining permission from the landowner, American archaeologists were expelled by government officials two months into their work “with the additional indignity that all the objects they had thus far discovered were ‘one fine day seized, thrown into the open trenches, and covered with earth’” (interior quote, Stephen Dyson). 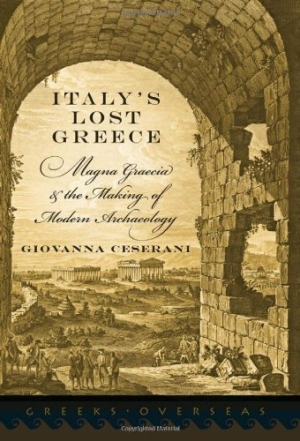 Italy’s Lost Greece is dense with obscure archaeological detail carefully transformed into a compelling description of Magna Graecia’s vital importance within European archaeological history. The truth of the matter is that the best Greek temples are found in Italy, and Ceserani’s work is a profound gift to Italian travelers and historians alike.